Each of these 18K white gold stackable wedding bands holds .23 carats total weight of diamonds. 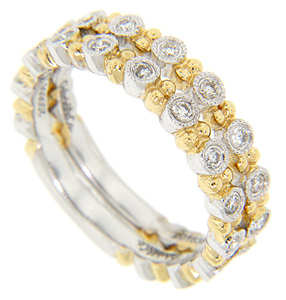 Yellow gold accents are spaced between the faceted round diamonds. Each band measures 2.5mm in width. Size: 6 1/2. We can re-size. 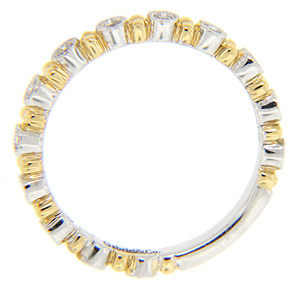 The bands are frequently purchased as a set for $1740.00, and in 14K gold for $1,350.00 but they are also available individually in 18K gold.